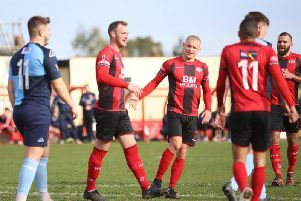 Okay, crisis might be a little strong after a draw and a defeat but such are the standards at Kettering Town this season, things going off track seem to provide a bigger shock to the system than normal. But the Poppies got well and truly back on the horse as they completed a 3-0 victory over Lowestoft Town at Latimer Park. It wasn’t as straightforward as it sounds, however, as the visitors made life tricky for Marcus Law’s team for long spells as they defended resolutely while the Poppies dominated possession. In the end though, two goals in the space of one second-half minute took the game away from Lowestoft as Kettering powered on at the top of the Evo-Stik League South Premier Division Central. They still have Stourbridge for company up there but, for the time being at least, a two-horse race has developed in the battle for the sole automatic promotion slot. But this game was all about the Poppies bouncing back after the 4-4 draw with Redditch United and the 3-0 home lose to St Ives Town. With a strong wind and a heavy pitch to contend with, Kettering did what they needed to do. They played to the conditions. When they needed to go long, they did and when the chance came to play, they showed that extra bit of quality. And, more importantly, they were solid defensively. They ensured Lowestoft rarely troubled Paul White in goal with a much more robust approach than in the last two matches. This was a welcome return to form, although they were given a helping hand with the opening goal five minutes before half-time. Chances had been at a premium with Gary Stohrer shooting just wide of the post with the best of them before the deadlock was broken. A ball forward saw visiting defended Adam Tann facing his own goal with Aaron O’Connor applying the pressure. And Tann knocked the ball beyond onrushing goalkeeper Elvijs Putnins with O’Connor racing on to score into an empty net. Dan Holman, who worked incredibly hard and showed some classy touches, was in the team after a successful appeal against his red card against St Ives and he went close to doubling the lead early in the second half as he headed over from a Dion Kelly-Evans. But just as a nervy silence was beginning to take a hold on the home supporters, the game was put to bed in the space of a minute. It was 2-0 when Declan Towers, an imposing figure at the back, directed a header into the corner from a pinpoint Marcus Kelly free-kick. And the impressive Kelly made it three just 42 seconds later. A flowing move involving substitute Rhys Hoenes ended with Holman picking out Kelly who applied a calm finish into the bottom corner. Skipper Michael Richens was just off target with a long-range effort after a driving run through the midfield and Holman shot over the bar in stoppage-time as he sought the goal his display deserved. In between all that, Lowestoft actually took a grip on proceedings but with Towers, Durrell Berry and Lathaniel Rowe-Turner marshalling the defence with plenty of aggression, chances were few and far between for the visitors. This was much more like it from the Poppies after a couple of setbacks. Poppies: White; Kelly-Evans, Towers (sub Toseland, 77 mins), Berry, Rowe-Turner; Richens, Stohrer, Kelly (sub Solkhon, 80 mins), Meikle; O’Connor (sub Hoenes, 56 mins), Holman. Subs not used: Milnes, Graham. Lowestoft: Putnins; Brown, Tann, Jarvis, Wilkinson; Shaar, Deeks, Fisk (sub Fowkes, 32 mins), Pollock (sub Vega, 64 mins), Smith (sub Wren, 87 mins); Bammant. Subs not used: Reynolds, Hedge. Goals: O’Connor (40 mins, 1-0), Towers (66 mins, 2-0), Kelly (67 mins, 3-0). Bookings: Smith, Brown, Richens (all fouls). Northants Telegraph man-of-the-match: Marcus Kelly - There were numerous contenders, not least Dan Holman who led the line with a touch of class, but it was Kelly who really helped put the Poppies in control. Deployed in a more attacking role, he made things happen but the game really hinged on the two goals in the space of a minute in the second half. For the first, Kelly’s pinpoint free-kick found the head of Declan Towers who did the rest and then, just 42 seconds later, Kelly was there to finish a flowing move to put the game to bed. He was a big summer signing and once again, he showed just why the Poppies moved to bring him back.